Come along for game of treachery and opportunism. In Dogs of War you are a Victorian era mercenary captain vying for influence with battling houses in a war torn country. What is Dogs of War like? 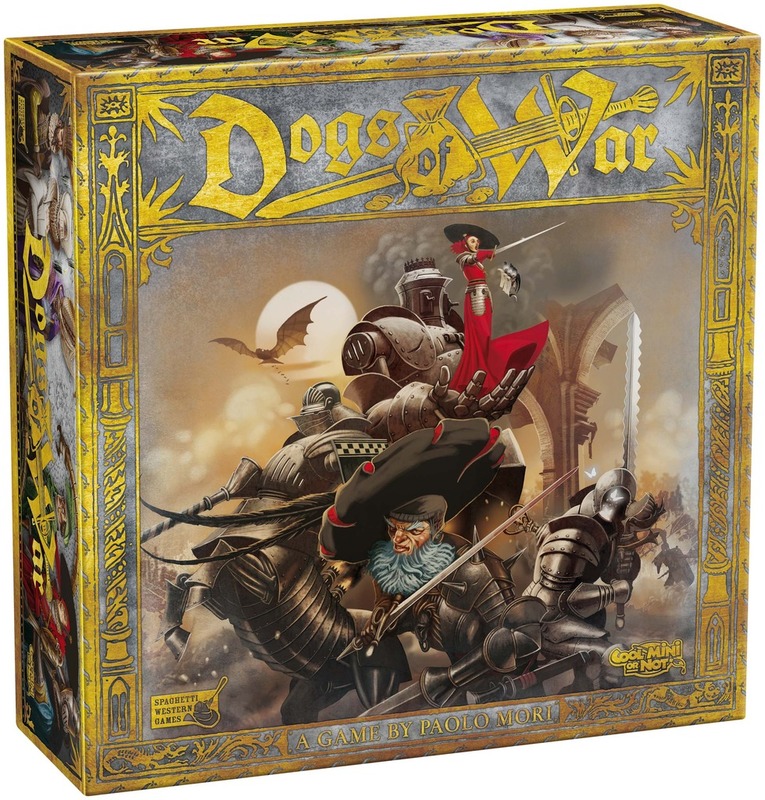 Dogs of War is a tug-of-war and area control game with a high level of interaction. The game takes place over four years and three battles take place in each year. As the player you try to make sure the houses you help are winning the battles. In the beginning of a year, you randomly set up what houses fight each. Then players in turn buy new troops openly, giving the other players hints to what they might be trying to achieve. Players chose to place a captain on either side of one of the three battles along with a card that represents the troops who fight with it. You place your captains on spaces on so called order of battle cards. Most spaces have a reward for placing a captain and some have requirements in form of a specific troop type to play along with it. The rewards can be additional influence points, money for buying more troops, additional captains, troops and tactics cards. At the end of a year you count up what sides won each battle (the one with most soldiers) and the winning house progress on the House Victory Track. The House Victory track determines how many victory points your collected influence points with each house are worth at the end of the game. This all sounds more complicated than it actually is. In reality, the game zips by and once you have played a round of the game you ‘get’ it, and it really comes alive. The game is not a children’s game by any means, but I would think it would be very enjoyable with early teens who like to get an opportunity to get at each other in a friendly way. The production quality of the game is through the roof, and to be honest a bit more than this kind of game really needs. But it does add to the visual spectacular of playing it. And this is a spectacular game. It is an intensely social, cutthroat and backstabbing affair where you get great arcs of excitement. In Dogs of War nothing is set in stone, and you might shift away from supporting one house one year to throwing everything you’ve got behind a different house next year. I have not had so many laughs and ‘oh no you didn’t’ moments in any game for a long while. It really is a game where you leave the table feeling like you played out an epic story with and (mostly) against your friends, and this is quite rare in a game that plays within an hour. I have only minor knocks against the game. The Tactics cards are quite situational, and you might end up with a bunch that you can’t use simply by the luck of the draw. This can be a bit frustrating when your opponents are playing perfectly timed tactics cards left and right. However, as tactics cards are also worth victory points at the end of the game, it isn’t all that bad. This game over delivered. It is a lot more fun than I had expected. The genuine laughs I’ve had with this game makes it a big hit with me. This isn’t a strategic heavy euro, but when you want to get in your friends faces and don’t want to go all out on a dice heavy ameritrash game – this is the perfect fit. Therefore this it is a definite keeper for me. It’s not one for every game night, but when I get it out I KNOW that I will have fun. One caveat is that the game really need four or five players. It functions mechanically with three, but I do not recommend it. Some people will dislike this game if they dislike the fact that it is a game where you play your opponents as much as you play the game or if they don’t like games where you can be really aggressive to your opponent. Furthermore, I do think that you probably want to avoid playing this with someone who bears a grudge too much. In any other case, this is a win and I really recommend this game. Fun is where this game shines. The laughs, the table talk. This game is social gaming at it’s core and it plays so quickly that you don’t grow tired of the mechanics before it is over. And then, you want to play it again to have your sweet revenge on the player who stole the victory from you! When playing this game, I don’t feel like I’m a mercenary captain. And as such one might argue that the theme isn’t very strong. On the other hand you do get the feeling of being someone who sits behind the lines and pull the strings trying to get the most influence. The tactics cards feel very disjointed from the rest of the game thematicly, and some of the rewards on the order of battle cards do as well. With one exception, everything in this game is a clear homerun. The miniatures are incredibly detailed, and the board is stunning with its golden patterns and functional layout. I do wish they had used a different font, as the one they chose is a bit hard to read, although thematically engaging. It feels like there is a leap you have to do when going from the rules to playing the game. Everything is explained quite sufficiently, but you really have to go through the rulebook while setting up and playing the first round. After that, it is easy. The layout allows for relatively easy referencing, so any rules disputes are solved quickly, and we did not find and any conflicts or unclear descriptions.